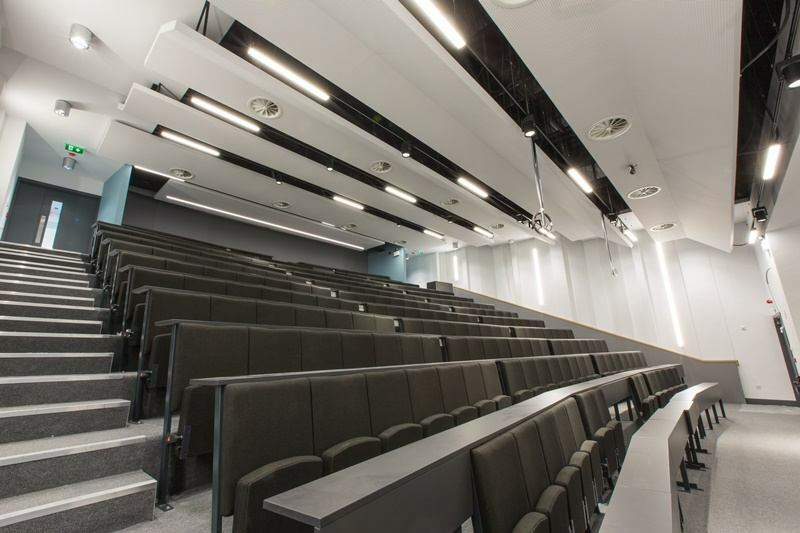 This project involved the extension to the Stokes Building at Dublin City University. This €10 million cutting-edge teaching facility includes lecture rooms, teaching spaces, offices & two stacked double height lecture theatres based on the traditional raked auditorium design arranged above each other and are flanked with a variety of other flat floored teaching spaces catering for numbers varying from 40 to 80+ students. This project is a critical part of the DCU capital programme. Located on the DCU Glasnevin campus, the building is designed to cater for 1100 students, and facilitate the growth in students numbers with the Incorporation of DCU. The project was technically and logistically challenging, with limited site access and work which involved tie-ing into a live academic building on multiple levels. Clancy responded to this challenging project, with technical expertise and building craft to produce a building which involved the collaborative efforts of a contractor and the design team in its delivery. This was a live 3rd level educational campus where traffic management was extremely difficult due to the location and restricted nature of the site together with the high volume of general traffic passing through the middle of the works. The project was completed to highest level of workmanship with no disruptions to the daily activities of the DCU campus.